SAP Business Objects offers a broad portfolio of tools and applications designed to help you optimize business performance by connecting people, information and businesses across business networks. 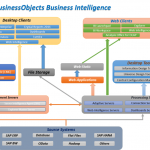 SAP BUSINESS OBJECTS is an integrated query, reporting and analysis solution for business professionals that allow you to access the data in your corporate databases directly from your desktop and present and evaluate this information in a SAP BUSINESS OBJECTS document. 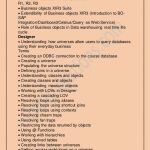 SAP BUSINESS OBJECTS makes it trouble-free to access this data because you work with it in business terms that are known to you, not technical database terms like SQL. You don’t need any knowledge of the database structure or technology. SAP Business Objects also offers consulting and education services to help customers deploy its business intelligence projects. Once you’ve used SAP BUSINESS OBJECTS to access the data you need, you can present the information in reports as simple as tables or as sophisticated as dynamic documents with drillable charts. You can then save those documents for your own personal use, send them to other users, or publish them to the corporate repository for potentially even broader circulation.